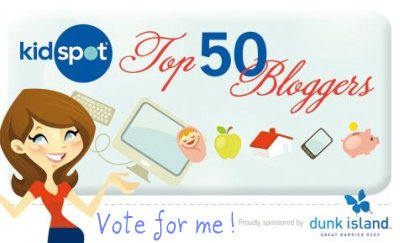 Kidspot has just announced that Babyology has been nominated in their Top 50 Bloggers for 2010. I am an avid follower of many of the blogs on the list and feel privileged to be part of such a terrific group. As much as I hate to ask you, our loyal readers, for favours it would be terrific if you could vote for us and it only takes a second. If you enjoy what we do over here at Babyology, I’d be so grateful if you voted for me. It’s always exciting to be in these competitions! All you have to do is click here and click “vote for me”. Thanks in advance for your support!